Shipe d June 2011!! !precision engineered in Italy, sturdy and built to last. With the Imperia and its “Duplex” cutter, you can make pasta dough in 6 different thicknesses and two types of pasta: tagliatelle and fettuccine Using the accessories of the Imperia (to be purchased separately), you will be able to prepare a vast range of pasta dishes: round spaghetti, capelli d'angelo, tagliatelle, trenette, fettuccine, lasagnette, pappardelle, ripple-edged reginette, raviolini, ravioli, cavatelli, gnocchetti sardi and rigatelli. The Imperia pasta machine is amazingly easy to use and highly versatile, making it possible to prepare fresh home-made pasta in just a few minutes! You can get 6 different thicknesses from the rollers, which are 150 mm (5.9") wide. "Sfoglie," or "sheets," are the most widely used form of pasta, from which to make many pastas and pastries. Dice the mozzarella cheese, remove the salt from the anchovies, peel the tomatoes, and slice them. Cut the pasta sheet into 12 rectangles, so that each is about 3" x 5.9"
Cook the cut rectangles for a few minutes, drain and lay on a moist tea towel. Fill the pasta with mozzarella, anchovies and the Parmesan, then roll carefully to seal. Heat the oil in a saucepan, add the tomato pulp, add salt, and cook, flavoring with minced basil. Align the cannelloni in a buttered, oven-proof baking dish, cover with the tomato sauce, pepper to taste, sprinkle with grated Parmesan, and cook for about 20 minutes in a preheated 350°F (180°C) oven. Brown the onion in half of the butter and in the oil. When golden, take it out and put the minced beef and chicken livers in the saucepan, together with the mashed tomato and chopped mushrooms. Cook slowly for about an hour. Cut strips of pasta about 4" wide and boil in plenty of salted water, then drain when slightly underdone. Arrange layers of lasagne and sauce in a buttered baking dish, sprinkle with Parmesan and put the pieces of remaining butter on top. Then bake at medium temperature for approximately 15 minutes, and serve. 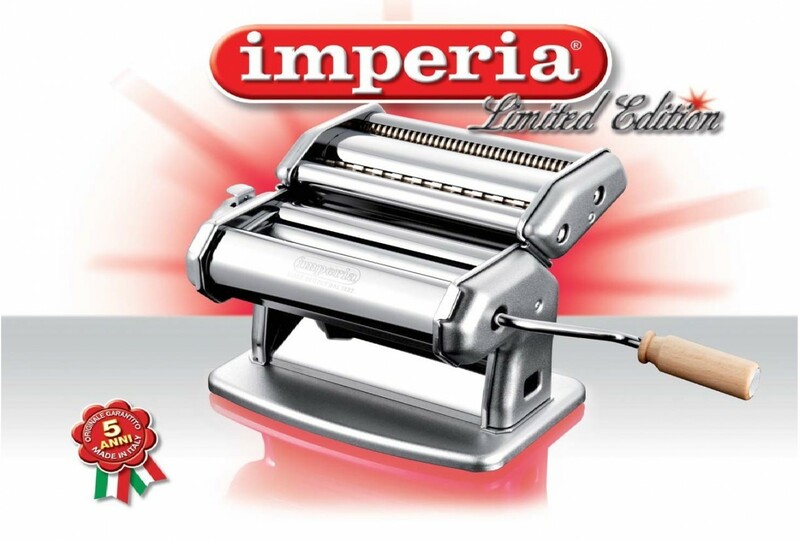 Click the button below to add the Imperia Pasta Machine Limited Edition to your wish list.